Being a marketer for the past eight years, I try to learn new things and apply new strategies for my clients. I never thought I would exploit a marketing tactic intelligently to get more rewards while booking an air ticket online for my wife who is coming to India to attend my brother’s wedding in July 2016. This article is about how I saved considerably for an air ticket booking, exploiting a simple tactic used by the marketing team and a critical reflection of it. As mid of June is a busy season, getting a cheaper air ticket would be a daunting task. I tried air tickets from Yatra.com, Skyscanner, Expedia and few travel agents as well. Interestingly, the price given by the travel agent was INR 10,000 less than the price I have got from Yatra, Expedia and other travel websites. I tried to book the ticket from the Yatra and abandoned the transaction during the booking stage. So, the Yatra customer care gave me an offer for INR 1,000 less than what the travel agent quoted me. So effectively, INR 11,000 have been saved from this negotiation. This didn’t stop me from doing further research online. Finally, I thought I should try searching prices directly from the Etihad website. To my surprise, it is very close to what Yatra offered me. There comes the marketers mind. I tried to book from Etihad website but again abandoned the transaction at checkout page. I did this on purpose as I saw the Facebook remarketing pixel was loaded. Remarketing is a technique to bring back the visitors who are dropped from the website without completing an intended goal. The image given below explains the remarketing process. I browsed through my Facebook after a couple of minutes. Without any surprise, I got an offer of 10% discount using remarketing technique on Facebook, as given below. It may sound very fascinating for you, as I was able to save over 14.4% from my initial price. So effectively, I saved around INR 22,400. It is a fairly decent saving for someone living in India. By not doing this process, I would have purchased a ticket at the original price. The detailed savings are explained in the table below. The ticket price includes my wife’s return ticket and my one side ticket. 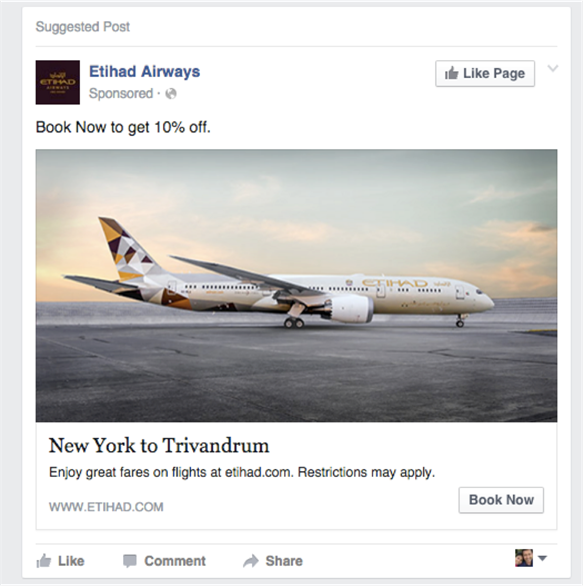 I have few learnings and advice for marketers as well as the Etihad marketing team. Firstly, I should appreciate the Etihad marketing team for giving me the discount, as it would have gone to an agent if I booked elsewhere. I have a word of advice for Etihad marketing guys. I still have the ad appearing on my Facebook even after completing the transaction. I think they should remove me from the audience list. Remarketing has been one of the greatest tool used by marketers to bring user who has visited the website before. Use it cautiously and don’t annoy users and give clear benefits to bring the user back. Discounting is a great way to activate an incomplete transaction, but there are perils attached to it if not used wisely. No machine learning system could beat human intelligence. Human brain is hardwired to beat and overcome even the toughest situations. Marketers should think of many user journeys and micro moments to utilise the opportunities to engage prospective buyers. If you are doing remarketing, you should build many user journeys as you could, so better targeting and consumer engagement is possible. Make sure the user should be removed from the audience list once the visitor completes the purchase. So, next time you are trying to book travel tickets online, try to research, or simply use the method outlined above. It will surely save you some good money! About the Author: Sanil Subhash Chandra Bose is a digital and analytics entrepreneur with over 11 years of experience. He runs a digital and analytics agency Ayruz Data Marketing, which serves retail, FMCG and e-commerce clients in the UK, Ireland and India. "How to Get Cheaper Flight Tickets Online – A Digital Marketing Insight", 4 out of 5 based on 17 ratings. Now Refill Your Delhi Metro Card With Paytm Wallet! Thank you so much for this wonderful article. It was worth reading.